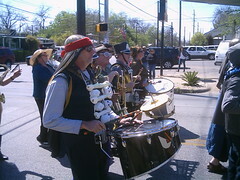 Thank you, Honk!TX for parading again this year. Portable music that lifts the spirits and does not require protection for the ears is in scant supply and for that reason very, very welcome. Even the many dogs along the parade route looked happy. Children appeared to be happier still. Every group in the parade was a delight, and there was some wonderful musicianship. Among the extensive list of those in the parade, there’s no way to pick favorites, really, but we truly did love the Biohazard Brass Band, a super-sharp military aggregation, here all the way from Fort Sam in San Antonio. We were so busy listening, marching, and watching that we took few pictures with the toy camera and not many unedited videos, either, but they are souvenirs of a wonderful day.